I like having recipes on hand that are easy enough for the boys to make on their own. We took the basic no-bake chocolate peanut butter bars recipe and swapped out the powdered sugar with honey (you can use more or less to taste) and added some oat bran for extra hardiness. The whole family gives them a thumbs up, and my youngest enjoys beating on the graham crackers to crush them. You can buy graham cracker crumbs if you like, to put this together even faster. Otherwise, you can crush the crackers in a food processor or put them in a sturdy plastic bag and have a boy beat on them with a rubber mallet or roll over them with a rolling pin. 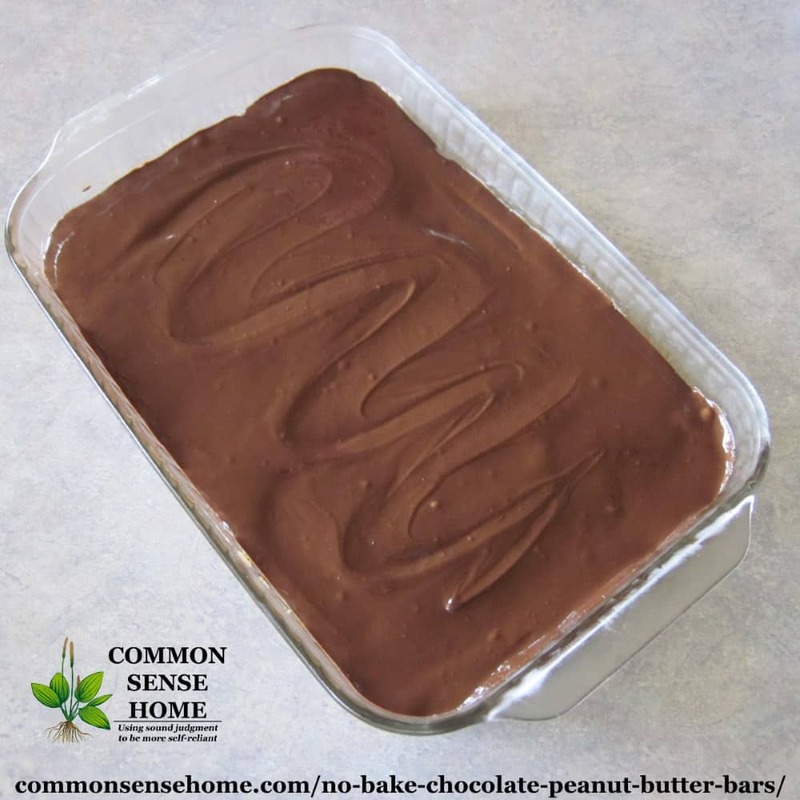 You could make these no-bake chocolate peanut butter bars gluten free if you like, by purchasing gluten free graham crackers and gluten free oat bran. If you don't have oat bran on hand, you could substitute some flax seed (1/4 cup) and more graham crackers, or some hemp seed, or just more graham crackers. The recipe is forgiving. You can use regular size chips if you don't have mini chips on hand, or even chunks. 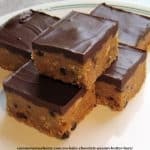 With the chunks I'd melt them all with the 3/4 cup peanut butter and spread them on top instead of mixing with the graham crackers, as they would tend to make the bars fall apart. I did need to open two packages of the Enjoy Life chips, as one package was just shy of two cups of chips. Blend 1 1/4 cup peanut butter (reserve 3/4 cup for topping), butter and honey in a large bowl until creamy. Mix in oat bran. Mix in graham cracker crumbs and 1/2 cup mini chocolate chips (reserve 1 1/2 cup chips for topping). Press mixture into baking pan and even out the top with a spatula. Melt 3/4 cup peanut butter and 1 1/2 cup mini chips in a heavy bottom pot at low heat, stirring until smooth. Don't crank the heat up, as scorched chocolate may get hard instead of soft. (Ask me how I know…) Spread chocolate/peanut butter mix over graham cracker mix. Refrigerate two hours or overnight, until firm. (This is a great make ahead dessert.) Cut into bars. Store in refrigerator. Makes around 60 bars. 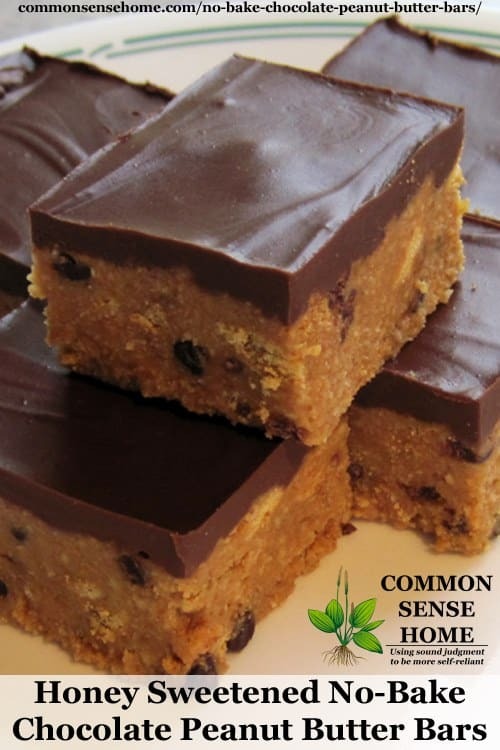 A less sweet version of the classic no-bake chocolate graham cracker peanut butter bars. Grease/butter a 13×9 inch baking pan. Blend 1 1/4 cup peanut butter (reserve 3/4 cup for topping), butter and honey in a large bowl until creamy. Mix in oat bran. 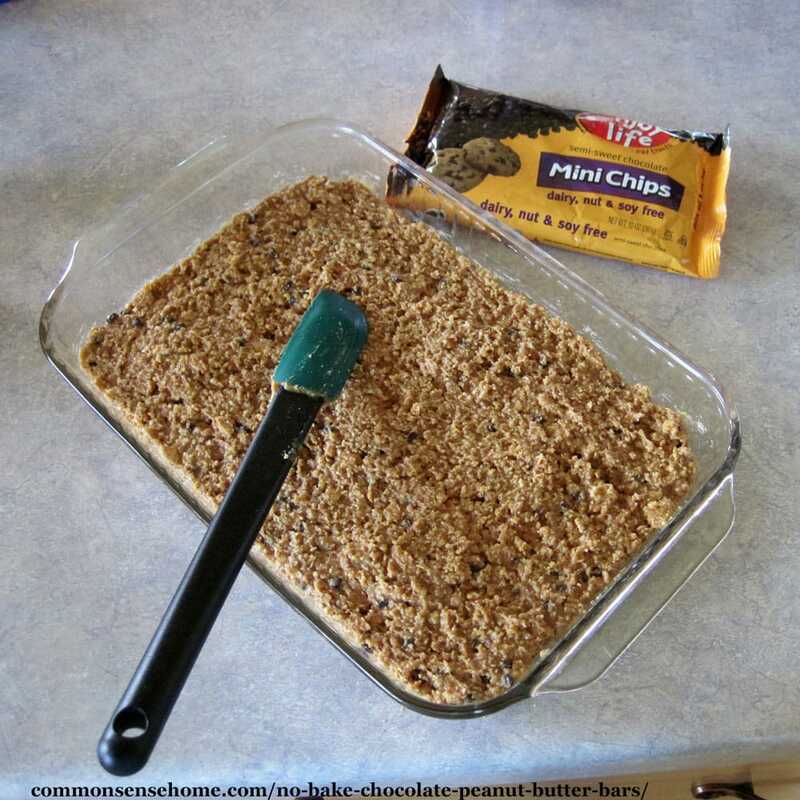 Mix in graham cracker crumbs and 1/2 cup mini chocolate chips (reserve 1 1/2 cup chips for topping). Press mixture into baking pan and even out the top with a spatula. Melt 3/4 cup peanut butter and 1 1/2 cup mini chips in a heavy bottom pot at low heat, stirring until smooth. Spread chocolate/peanut butter mix over graham cracker mix. Refrigerate two hours or overnight, until firm. Cut into bars. Store in refrigerator. Makes around 60 bars. This is a great make-ahead dessert. Originally published in 2013, updated in 2017, 2018. I really did enjoy these! I love the substitutions. My 9 yr old daughter made these today, and everyone killed them. We didn’t have any graham crackers, so she used regular club crackers and added a bit more honey (though molasses would have probably been even better, now that I think about it! ), and they were plenty great. Thanks for the recipe. Hi! These look killer good! I am putting these on the list to make next month(if possible). What is oat bran? I don’t know of any store around here that sells it. What is a substitution for it? Does it really need oat bran? I would really love to make these. Thanks! Serenity – saw your second comment, but wanted to add a note about the oat bran. A friend of mine originally suggested it (she substituted for some of the powdered sugar in the original recipe). It turns out, we really like it, because it makes the bars more substantial and chewy/nutty good. A smaller portion is much more satisfying. You can find oat bran in most natural food sections/stores, and sometimes in the baking aisle or cereal aisle of the store (or online). You could use coconut oil instead of butter too. Thanks for mentioning that! I was wondering, since we don’t use butter. I was also wondering about subbing something else instead of the graham crackers. It’s near impossible to find healthy ones. What about quick oats??? The graham crackers would give a lighter texture, but I’m an oatmeal fan in just about any form. You might need to adjust the butter or peanut butter a little to get the right texture. These turned out AWESOME! I melted the chips in the microwave and then added the peanut butter, using the same bowl in which I mixed the graham cracker mixture, meaning I managed to use one bowl, one spatula, and the pan. Easy clean up is a huge boon in my opinion. The oat bran made the texture similar to my mom’s peanut butter balls, which are a huge hit, but much faster! Another totally awesome thing about these?? I used my hands to press the bars into the pan this time (sue me, I promise I won’t give them to anyone outside my household ;)), and between all the awesome natural oils, the honey, and the oat bran, it makes fabulous hand scrub. My hands are incredibly soft! I just rubbed what stuck to my hands all over them and then washed it off with a drop of dish soap. You’re not supposed to use your hands to press them into the pan? I have found the same thing to be true when dismembering pastured chicken – oh so soft hands! what are graham crackers. We don’t have them in South Australia. What can I use instead? Graham crackers are a lightly sweetened, thin, crisp cookie-like cracker. You could probably substitute something like vanilla wafers if you have those, or oatmeal, but oatmeal would create a much heavier bar. The closest thing to Graham crackers would be McVities Digestives. I’m sure you get those or something close in Oz. Thanks, Olivia. I’ve never had the chance to go shopping outside the U.S.
Can I substitute coconut oil for butter? and almond meal for bran? The flavor and texture will be different, but I don’t see why it wouldn’t work.